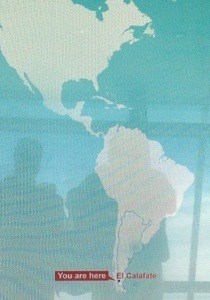 Greetings from the farthest point south that this fellow has ever traveled! The Patagonian region of Argentina is home to the the third largest ice field in the world, and Los Glaciares National Park. At roughly 18,000 square kilometers, the ice covers an area larger than the entire state of Connecticut. 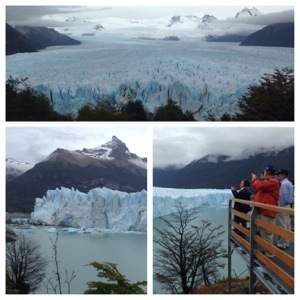 We visited the Perito Moreno glacier, the third largest glacier in the field. It sits in a state of equilibrium, neither advancing nor retreating from its current location since records have been kept. 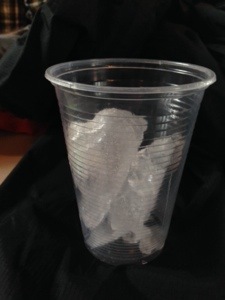 As ice falls from the front of the glacier, an equal amount of ice is created in the rear. This process happens very slowly, as the ice that reaches the face of the glacier is 300-400 years old. It takes about 10 years for a snowflake to turn into glacial ice, with the local sunlight, temperature and altitude assisting the process. The oldest and most dense of this ice appears to be blue, while streaks of minerals dash across the glacier’s face. Perito Moreno rises up to 200 feet above the lake’s surface and dips 350-450 feet below the water level. 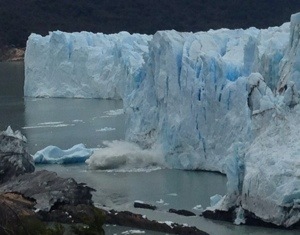 The glacier continually moves, advancing about six feet per day. Ice constantly falls from the glacier into Lake Argentino in spectacular fashion. The ice cracks with the sound of thunder and the lake’s glass-like surface comes alive with waves created by the force of the falling ice’s impact. Every 2-6 years the glacier advances far enough to create a dam between two fingers of the lake. The water builds up and eventually cuts an arch under the ice. As the arch weakens, the ice collapses and explodes from the pressure of the water behind it. 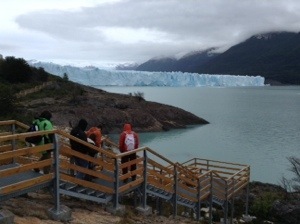 Our excursion with park guide Marcelo took us through high and low views of the South and North Face of Perito Moreno. The pictures shown here can hardly share the majesty of what we witnessed. The glacier provides life to the Patagonia Steppe. Much of the area receives less than 2 inches of annual rainfall. The water of Lake Argentino serves as the water source for El Calafate, and provides ground water for the few estancias (ranches) that dot the arid countryside. It also makes a nice compliment to any beverage at the park’s snack bar! Stay tuned for more coverage from VALOR’s stay in the Patagonian step….